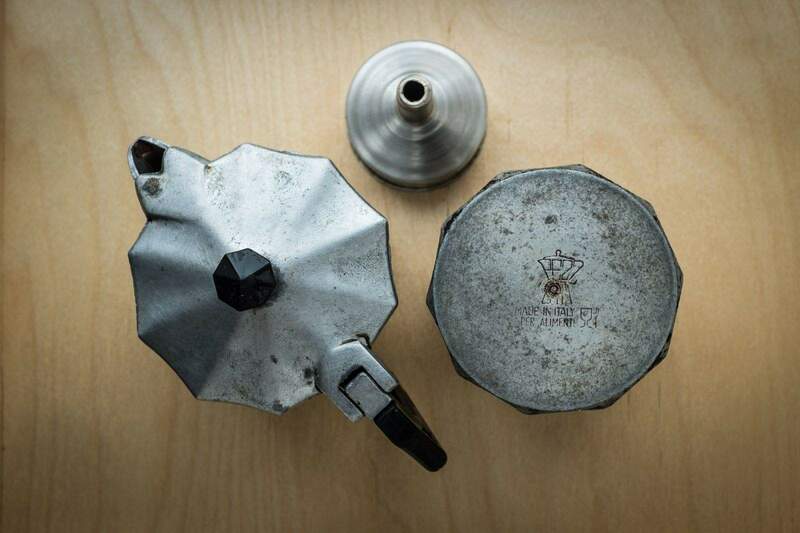 Before the AeroPress, there was the moka pot, or cafetera as it’s called in Spain. There is at least one cafetera in every Spanish kitchen, and if you want a quick fix of something strong and good, it’s your go-to coffee gadget. Not bad for something invented way back in 1933. I’ve had a moka since I first saw one in action a couple decades ago. Up until I bought an AeroPress, I used a moka every day, never tiring of its old-school charm and serious wake-me-up taste. But what is a moka exactly, and why is it so good? 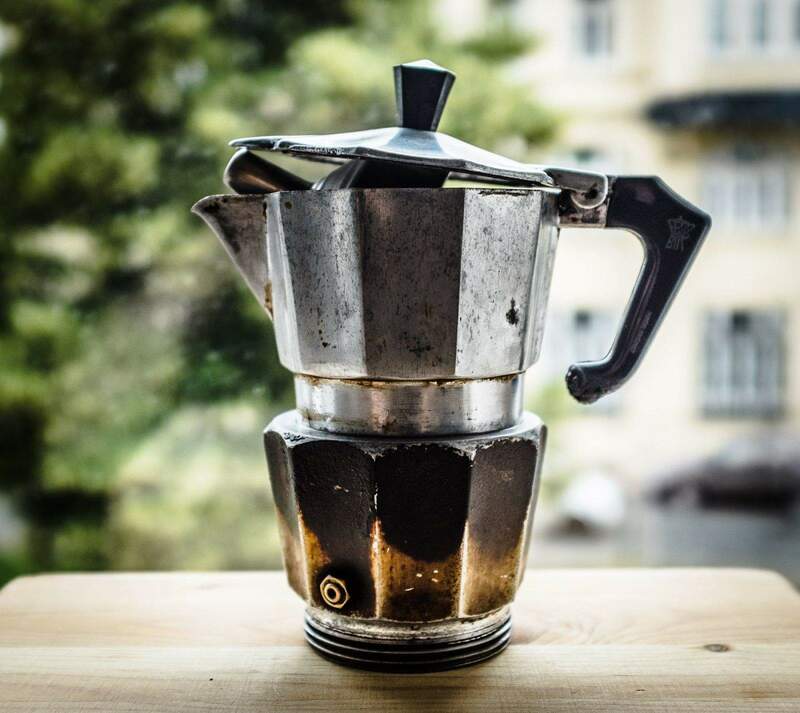 Some call the moka pot a “stovetop espresso” maker, and you can see why. You get strong, bitter and sometimes thick coffee, and the appearance of a crema when the coffee first erupts from the inner chimney. But as we’ll see, the pressure in a moka (around 3 bar) isn’t anywhere near the 9 bar produced in the coffee crucible of an espresso machine. Bubble, bubble, toil and (no) trouble. 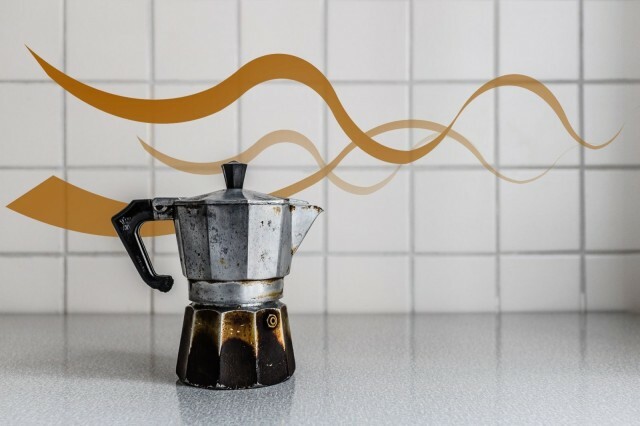 The moka uses pressure to force hot water through ground coffee, and the cleverly shaped pot lets the resulting syrupy liquid bubble up into a top chamber through a chimney. It comes in three main parts: The bottom section holds the water for boiling. The top section will receive the coffee. In between is a metal funnel with a perforated disk set into it. This is where you put the coffee grounds, before dropping the funnel into the mouth of the water boiler and letting the thin end of the funnel submerge. When the water boils, the pressure forces the water up through the funnel tube and through the coffee, and then out through the chimney and into the pot. The moka makes a bitter, strong brew, with none of the richness of a “proper” espresso and none of the subtlety of a drip or AeroPress. But it’s good enough, and with a little care (and a few hacks) it can be amazing. The real appeal is the ratio of easiness to quality. Stick some decent coffee in the basket, screw the pot shut and crank up the gas on your stove. In a few minutes you have something worth getting out of bed for (although technically you are, of course, already out of bed, unless you sleep in the kitchen). You can also use the pot anywhere. I’ve taken mine on vacation (not so practical unless you have a stove to heat it on) and on camping trips (a campfire will work, but a small stove is better, if only to stop the flames from melting the moka’s plastic handle). And when I moved into my current apartment, we used the cafetera every day until our stove arrived, cooking the coffee on top of a camping gas burner on the kitchen floor. If you have fire, water and coffee, you can make a moka. If you use the pot according to the instructions, it’ll work fine: Fill with cold water, add coffee, tamp but don’t press the grounds into the basket, screw the pot tight and put it on the heat. But two modifications will up the quality of your coffee way more than should be possible: First, boil the water before you put it in the pot. Second, take the pot off the heat before it’s done. If you start with cold water, so the thinking goes, the coffee spends a lot more time getting hot before the water hits it, and this degrades the flavor. I don’t know how true this theory is, so I checked it the old-fashioned way, with experimentation. If everything else is left the same, coffee made with boiling water is indeed better, with a lot more of the volatile coffee flavors left intact. A plain old aluminum model is just as good as the fancy steel ones. Starting from cold gives a less interesting, dustier-tasting brew. Also, my electric kettle boils water quicker than my stovetop, so it’s a faster method too. Just make sure that if you have an electric stove, you crank the burner to full before the water boils in the kettle. Otherwise you’ll lose your advantage as the grounds sit over hot water waiting for the stove’s electric ring to turn red. The second part is far more important. You should remove the pot from the heat as soon as the thick part of the coffee has come out. If you watch with the top of the pot open, you’ll see the first syrupy swirls of coffee flow down the outside of the chimney. As soon as you see this, reduce the flame to its lowest setting. This will give the water a little more contact time with the grounds. The rest of the liquid, still black and thick, will gush out. Watch carefully, because you want to grab the pot off the heat as soon as this flow starts to pale. You know how many coffee shops will make you a long coffee just by letting the espresso machine run longer, washing more water through the grounds? The pale liquid from your moka is the exact same crap, and will taste woody, bitter and burned. Stop the flow early. I put a little bowl of cold water next to the stove and dip the pot’s base in there. It stops the flow dead. You’ll soon get used to the timing. The only downside is that you get a little less coffee in the pot, but if that bothers you, just buy a bigger pot. Speaking of buying pots, these things are so cheap you can keep several different sizes. Most Spanish homes have one size for everyday use, and at least another bigger pot for family occasions (by which I mean “lunch”). I use a four-cup as my daily pot (or i did, until I switched to the AeroPress), and you can get tiny one-cup pots and huge 16-plus cup monsters. It’s super-simple, and spare parts are cheap — in the right country at least. The pot will last you forever. Most of it will anyway — the two main jug parts are pretty much indestructible, although the will wear out eventually. In Spain (and surely in Italy), you can go to the dime store and pick up a kit that contains a new filter disk and runner ring to replace those in the bottom of the top jug. I switched to a silicone ring this year and found it far better. It seals more thoroughly, lasts longer and doesn’t perish or degrade with heat. And – just as importantly – it doesn’t smell or taste of rubber. You’ll also need to replace the funnel basket from time to time, and when you eventually (and inevitably) put the pot onto the stove without filling it with water first, you’ll need a new handle to replace the plastic one that melted. All these spare parts can be had for coins in Spain. Elsewhere they can be harder to find. The Lady’s mother visited a month or so back and I had her bring me a new funnel from Spain, as they are impossible to find in Germany (where, according to my coffee dealer Peter, it’s called a Bialetti after the moka pot’s inventor). Store like this to keep the mold out, and everything in one place. 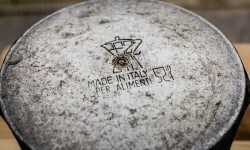 How should you grind your moka coffee? The easiest way is to buy a pack of preground coffee from any Spanish or Italian corner store, and then copy the grind size with your own machine. It should be a little coarser than espresso grind, but not much. Too fine and the pressure will build up behind it and cause steam to shoot out of the emergency escape valve in the moka’s base instead of through the coffee. You might also try non-burned coffee. The Italians roast their espresso beans dark, which gives a bitter brew. I prefer something medium to dark for the moka (and for espresso in general). The brewing method will still extract all the flavor, but that flavor will be better rounded, and not one-note bitter like you’ll get with an Italian roast. Probably the quickest way to get great coffee is to buy an AeroPress and a good burr grinder, then find a source of fresh-roasted beans. Failing that, use a moka. The results you’ll get even from dumping something like preground Lavazza or Illy coffee into the moka will show up your regular K-cup crap for the sludge it is. It’s also one of the best-looking gadgets you’ll have in your kitchen. Two final tips to finish. 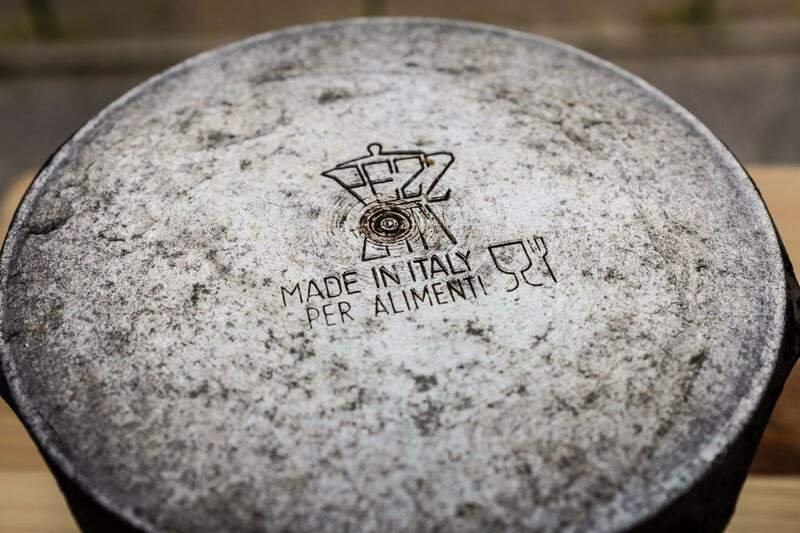 The Italians say you should never clean the inside of the pot once the oils of the coffee have covered its bare aluminum walls. I just give it a wipe every once in a while or things get gross, but never let soap near it. The second tip is for storage. Arrange the parts like in the picture above and you’ll never get mold inside the pot, nor will you lose shelf space. Now, all this coffee talk has made me thirsty. I think I’ll go make a pot of coffee. This is the second in Cult of Mac’s (ir)regular series on coffeemakers for nerds. For the best cup of copy to sip as you hammer on your clackety keyboard, read about the AeroPress.